Many conventionally built commercial roof decks have flat or low-pitched roof decks that are insulated only with continuous insulation, or rigid board insulation, placed on top of either steel or wood panel sheathing. Roof systems that included cavity insulation under the roof deck were more energy efficient. 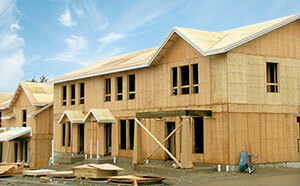 In three out of four climate zones, wood pitched roof systems were the most energy efficient. In all four climate zones, flat roof systems combining cavity insulation below the decks with rigid insulation on top of the decks were more energy efficient than flat roofs using only rigid insulation above the decks. Besides improved energy performance, there is a cost benefit to cavity insulation, too. Compared to rigid continuous insulation, cost per R-value unit is significantly lower. The model for the evaluation was a 28,500-square-foot, 27-unit, 3-story multifamily structure on a concrete slab foundation. With the exception of the roof/ceiling assembly, all building characteristics were identical in each building. The evaluation included Group R buildings in climate zones 3, 4, 5 and 6. RemDesign version 14.6.1, an industry-recognized energy modeling tool, was used to evaluate the assemblies. The results are demonstrated in Table 1—Roof Assemblies. A wood-framed pitched roof system with R-38 cavity insulation in climate zones 3 and 4, and R-49 cavity insulation in climate zones 5 and 6. A steel-framed flat roof system with only R-25 continuous insulation (c.i.) above the roof deck. 1. Insulation levels developed from 2015 IECC Table R402.1.3. 2. Insulation levels developed using commonly available fiberglass insulation cavity insulation and continuous insulation, per 2015 IRC Table R806.5. a. Monthly energy use of roof/ceiling assembly. b. Monthly energy cost. Energy cost derived using RemDesign default utility providers. c. Note that the I-joist roof system was 13% more efficient than the baseline wood pitched roof system. I-joist flat roof assemblies with cavity insulation consistently outperformed the roof assemblies with only continuous insulation above the roof deck in every climate zone evaluated, some by as much as 42 percent. Steel framing systems must increase the insulation levels above the roof deck insulation to deliver the same energy performance as wood-framed roof systems with cavity or attic insulation—a more-expensive solution than cavity insulation. Not only do wood roof systems deliver greater energy efficiency, they are also less expensive to build than steel-framed systems. When designing your next project, consider wood-framed roof assemblies to improve the energy-efficiency and cost-effectiveness of your design. Note: One of the greatest challenges when increasing energy efficiency is managing moisture and the potential for condensation to collect on the roof sheathing and framing. In traditional pitched roof systems, moisture is managed by ventilating the eave and ridge of the attic. Unvented flat roof systems currently minimize condensation by using rigid insulation on top of the roof decks. This is done utilizing guidance in Section R806.5 and corresponding Table R806.5, INSULATION FOR CONDENSATION CONTROL, of the 2015 International Residential Code which prescribes sufficient continuous insulation levels to control the condensation of moisture in unvented roof assemblies. These code requirements help to ensure that monthly average temperature of the underside of the structural roof sheathing is above 45 degrees (F). Make sure that your selection of cavity insulation and vapor retarder allow for adequate drying in the wood roof systems. Doing so will help extend the service life of the roof system.